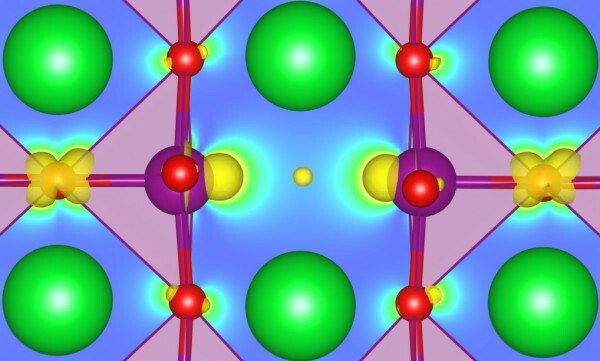 Some perovskite oxides, for example, have shown a wide spectrum of technologically relevant functional properties such as ferroelectricity and magnetism that can be tuned via strain. Strain, however, also couples with the defect chemistry to determine the material’s properties. SrMnO3 (SMO) is a particularly interesting example for examining the functionality resulting from a complex interplay of strain, magnetic order, polar distortions, and oxygen vacancies that are ubiquitous defects in these materials. In particular, theory has predicted SMO thin films to turn from antiferromagnetic to ferromagnetic with increasing oxygen deficiency, which is supported by recent experimental studies. These previous predictions were however based on density functional theory (DFT) calculations that incorporated a correction U based on the electronic and magnetic properties of stoichiometric manganites. While the inclusion of U—meant to correct self-interaction of electrons in complex oxides—is necessary in such materials, the specific choice of U based on stoichiometric material properties could lead to potential shortcomings in the description of defective SMO—manganese ions around the defect have a different coordination environment. Depending on the defect charge state, an added issue is related to the description of multiple oxidation states present in defective SMO. The formation of oxygen vacancies is generally charge-compensated by a reduction of the oxidation state (OS) of manganese ions adjacent to the vacancy, which may thus not be properly described by the same U. This is why University of Bern postdoc Chiara Ricca and colleagues decided it was critical to take into account local structural and chemical effects for each transition metal site in the oxide when aiming for an accurate description of defective SMO. In collaboration with a team at Nicola Marzari’s THEOS lab, which recently developed a density functional perturbation theory (DFPT)-based approach to compute U parameters, they used self-consistent site-dependent U values computed from first principles to study the defect chemistry and magnetic properties of SMO bulk and strained thin films. “This extremely close collaboration between the two groups, one focusing on methods development and the other on applications in defective oxide materials, was sparked by uniting these different research foci under the MARVEL umbrella” said the University of Bern's Ulrich Aschauer, one of the two PIs involved in the work. The results show that this self-consistent U improves the structure of stoichiometric SrMnO3 with respect to other methods, including one using an empirical U. For defective systems, U changes as a function of the distance of the transition-metal site from the defect, its oxidation state, its coordination number, and the magnetic phase of the material. Taking into account this dependence, in turn, affects the computed defect formation energies and the predicted strain- and/or defect-induced magnetic phase transitions, especially when occupied localized states appear in the band gap of the material upon defect creation.